RLH 62 was shown on Ewen Pring's RLH information Site as being in Columbus, Ohio having been there for over 15 years. In November 2007 a RLH 62 was listed on the Ebay online auction site as a "Best Offer". However the offers given by prospective purchasers were never accepted and it was unsold after two listings. I made an offer to the owner and this was accepted in early 2008. 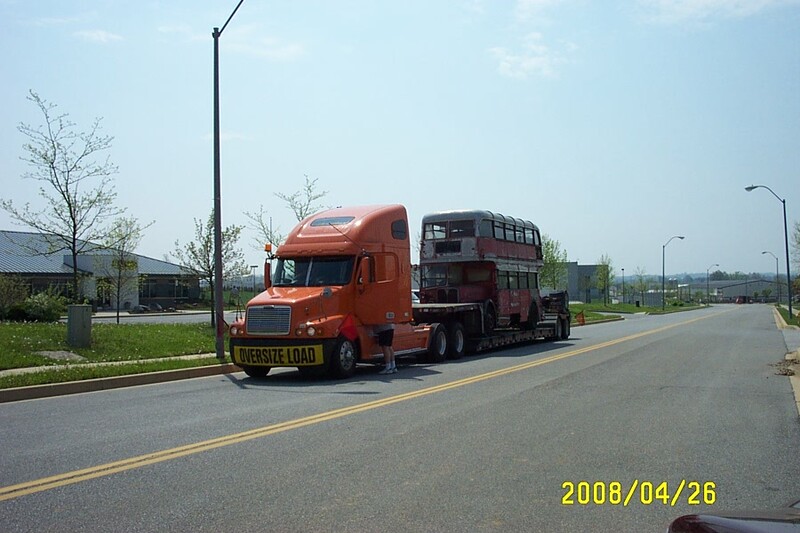 Although buying the bus presented a few problems in itself, the main problem was getting a double decker bus the 400 or so miles from Ohio to my house in Maryland. In the end I contracted with Landstar, a haulage contractor who actually move large products across the country including bits for the space shuttle! On 10 April 2008 I travelled over to Columbus to do some pre-move work on RLH 62. The condition was in some aspects better than what I was expecting and about right in other areas. 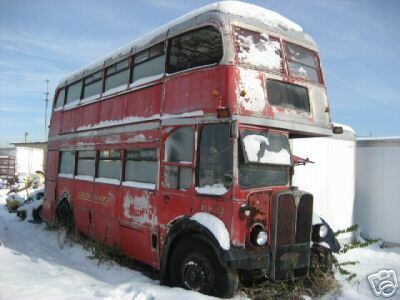 The bus was very original ex-London transport service. The only external changes were that orange coloured marker lights had been positioned in each corner panel and side reflectors fitted. Internally all seats were intact and still fitted with original LT pattern moquette covered seat cushions, though some in a poor condition. Original London transport posters were still in place in the lower saloon as well as an unused Gibson ticket machine roll under the stairs! Body work was not too bad but the weather had caused some of the wooden body inserts to start to rot out and the wood on the platform to had started to deteriorate significantly. To say it had stood outside in an open yard since 1990 only three panes of glass were missing: the front upper offside, rear downstairs and one of the small sliders on the upper deck. 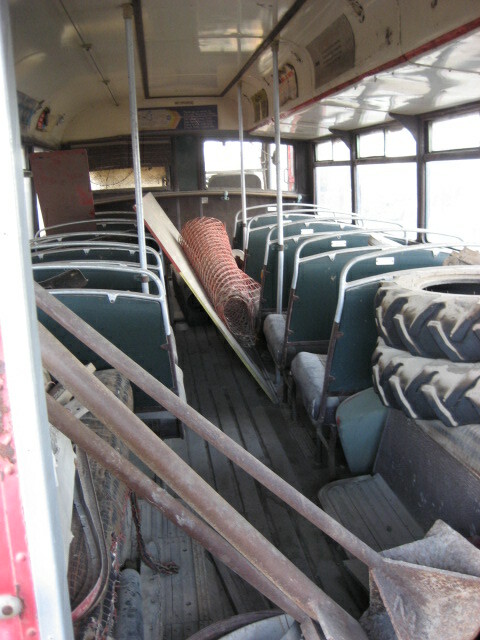 The bus had been used as a storage shed for some time - some parts, tyres and other junk were found inside. 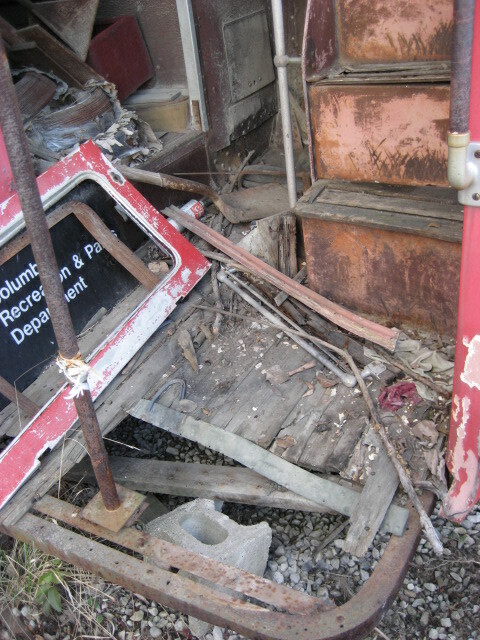 The driver's cab had a little modification in that a new electrical equipment had been fitted above the electrical box. 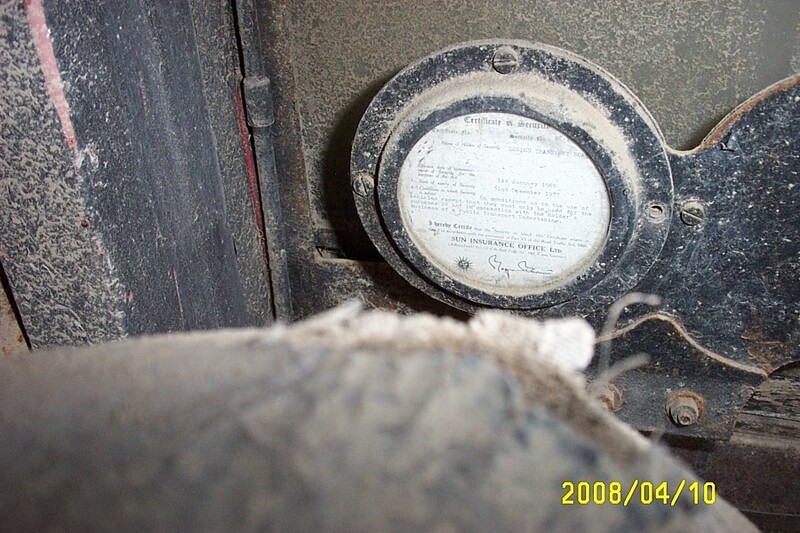 The LT insurance disc was still in the back of the holder as well as the Ohio Registration certificate in a frame at the cab's rear..
On 25 April 2008 RLH 62 set off from the Smith's yard (after being loaded by the helpful staff) en route for Maryland, arriving the next morning. 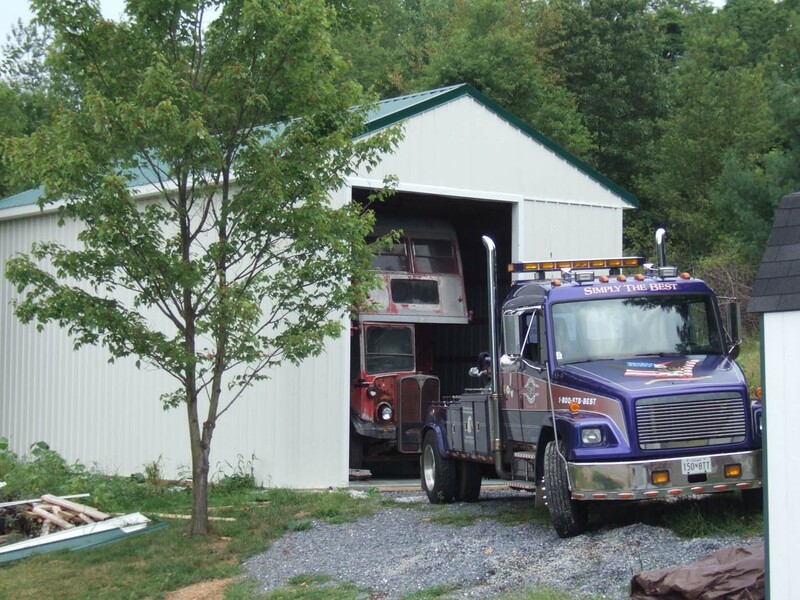 The vehicle was unloaded and my friend Ron Price, owner of STB Recovery (Simply The Best), towed the bus back to my house and into my purpose built pole barn. RLH 62 being backed into its new home. First time under cover since at least 1990.